From left to right: Günther Rosipal, Claes Sundin, Christer Bergström and an unknown Luftwaffe veteran. Picture taken at the Hannover-Laatzen Aviation Museum in Hannover 1998. On November 16, 2001, Günther Rosipal - passed away. Through his devotion for the Grünherzgeschwader, JG 54 in general and the life of late Hannes Trautloft, Günther has given an invaluable and unforgettable contribution to the history of WW II aviation. Hermann-Lietz-Schule - the same school as Trautloft had attended. In this modern era, we first came into contact with Günther through the Internet and Bob Wartburg's JG 54 Grünherz Site. 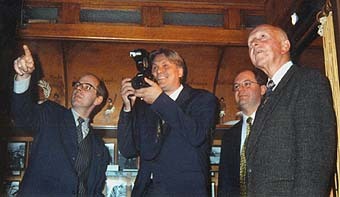 Through Bob, we made contact with Günther in 1997. From 1998 onward followed a regular series of research trips to Germany, tutored by the tireless Günther. Through Günther, we were able to approach not only the history of the Luftwaffe from a personal angle, but also to meet several of the pilot veterans - and to meet them on a personal basis, tutored by Günther. For many years, Günther worked for the Hannover-Laatzen Aviation Museum in his hometown Hannover, and he has rendered an invaluable work for this museum. Although Günther was occupied with the history of war, he never became occupied with war per se, but with the human beings trapped by war. His interest in WW II aviation was dictated by an interest in personal fates. To Günther, a human life was more valuable than anything else, regardless of time. We will never forget the occasion when Günther showed us a film of an aircraft archeology; when the film showed the small piece attached to the pilot's seat was dug out, Günther turned to us with tears in his eyes. "That was a man," he said. One of the happiest moments in Günther's recent years was when Hans-Ekkehard Bob agreed to publish Trautloft's diary. Thirteen months ago, Günther received the terrible news that he had lung cancer. Although Günther received the unselfish support from many friends, and the best medical expertise, fate could not be altered. During his final months, Günther worked hard to complete the editoring of Hannes Trautloft's memoirs - which he managed to fulfill only a few weeks ago. To his weary last breath, Günther continued to inspire us all and at the same time urge all fellow researchers to contribute to the history of Luftwaffe. Rosipal, a devoted husband, father, architect, musician, historian, and a dear friend, will live in our memory forever. The publication of Hannes Trautloft's memoirs will serve as a memory of Günther Rosipal as well. We will stay indebted to Günther.